The leaves are down and our yard was carpeted with them! I took pictures before Dan started to clean them up. Everything is coated with leaves! My garden fairy looks cute sitting in the pot with leaves all around her- I had to take a picture! My garden statue stands among the heap of dead plants and leaves. A cobbled set of stairs my husband and a friend created when we were doing the flagstone patio. I thought they looked like they were a hundred years old yesterday and made for an interesting picture. They are at the end of this long half wall we had built many years ago. This land has a continueous downward slop. The original owners left it natural but the dirt was right up next to the side of the garage which rotted the wood. We had our septic field rebuilt and while the bulldozer was there we had him swing around back and make us a path. Then we had the wall built and replaced the siding. I finally gave in and removed the rest of the annuals so everything is now empty. Objects like this will go into the storage barn for the winter. What a mess of leaves! They're everywhere! I would have bet money these roses were never going to open up! This is why I don't gamble!! Love the silvery tassles of this grass. We have a new species of shrubs- they grown their own brown leaves! The Weeping Mulberry tree made for a nice picture! The leaves of this Japanese Maple are just about to fall off but their color is so striking I had to take a picture! It's pretty to see but if we don't remove them our lawn will be ruined and it will get ugly quickly! These old Double File Viburnums have all been forgotten about. They were transplanted here when we put on our new addition in 1996. Their color struck me as interesting yesterday. Dan against the leaves- it's a losing battle at times! It certainly makes a shorter job of cleaning up the leaves! Hmm...where are Thing 1 and Thing 2 when you need them! This old tree broke in half one year....needless to say it was dead and I talked Dan into leaving it for the birds...as you can see they've made good use of it! It's big enough for me to stick my hand in but I didn't have the guts to!! We have a Pileated Woodpecker that visits a lot. I think he's resonsible for most of the larger holes on this tree. The sun was in and out all day and we actually got up to 80 degrees. That was primarily why we spent a Thursday doing yard work that we would normally have done on a weekend. The back is cleaned up now too! This looks like an ad for John Deere don't you think! He filled and dumped 10 loads of finely chopped leaves. 20 years ago we raked, and drug the leaves out on a tarp but after the new tractor came into our lives so did some new handy gadgets! This was the largest garden tractor we could get without going into the higher priced diesels. It's all hydrostatic controlled. Now after all the credit I've given to Dan I don't want you to think I wasn't doing anything! That's my corner I worked at through the day. I emptied the dirt from all my planters and set them over here and washed them up for storage. I got them all put in the garage too! The three big planters in front of the garage are still there. Those plants are still strong and hearty so I decided they look nice for now and I'm leaving them for a bit longer. I would bring things like this inside if I had room, but I don't! I make a pile out back and in the spring I reuse it. I buy that pre-fertilized potting soil in the bags but since some of my pots are so large I fill them with the old soil first and then top them off with some new. The last thing we have to do is cover the lawn furniture. I think we're about ready for the winter now! I am tired after looking at those leaves. They look lovely, but you have so many you can barely see anything other than them. Looks so nice after completing the work and I can see that leafer tractor would be a fantastic item to own. In fact you really need it for that amount of work. Oh, Man! The leaves are coming down in our yard and getting all heavy and wet with rain! We use ours as leaf mulch, though, and dress the beds every fall with it. Handy! You guys are on top of the yard work! So great! The leaves make a beautiful outdoor carpet. As I scrolled through the pictures, I was worrying about the back-breaking work facing you if you were going to have to rake them. I was SO happy when I saw the pictures of Dan on that John Deere! Wow, leaf city! That's a lot of leaves. It's a good thing you have that leaf vacuum. Dan is doing a great job. Things change..the leaves do look pretty. Here you are trying to get rid of leaves and I'm asking friends for any bagged ones. I have a 3 bin composter where I like to store leaves over winter to break down and they hold a lot. I also put about a 4 inch layer of leaves over my gardens. Since we have no lawn anymore, I can let them decompose where they fall. John Deere sure makes good toys for the men. I was looking at all those leaves and wondering how you would ever rake all of them up. I have never seen a little tractor like yours. I am sure my son wouldn't complain about the leaves if we had a tractor. Wow, Liz, that's quite the machine that Dan has there! I'm so jealous of all the leaf color; and if we had a tenth of that right now, I would be a happy camper. We just had a "cold" front move thru overnight...the high was 56 today! LOL! I look out back and everything still looks like spring and summer. Your leaves reminded me of my garden as we had to hand rake them ..ugh! Now we have fewer but they coat the whole back yard and we mow them up and use them for mulch as we use no chemicals on our grass. Lovely garden in fall! Yup, don't miss the leaves at all. We use to live by the woods and my hubby did the same thing with a much smaller John Deere. That's one of the reasons we moved to an active adult community, He got tired of doing all that. However, it really is pretty to look at and you live in a beautiful area! That looks like a really good mountain of compost in the making. It looks like you live in a little piece of heaven. Those leaves are glorious. Do you use them for compost? I can't imagine having to put everything away for the winter. You must have a big shed. I love your outlook. Good grief! I thought WE had a lot of leaves, but this just takes the cake...and the pie and the cookies and the candy and....!!!! Wow, Liz! That's a LOT of leaves!!!!! Our trees are steadily shedding theirs. The guy came on Thursday to get them up, but it looks as if he was never here. We had a hard freeze last night (first of the season)followed by wind this morning that just took TONS of leaves off the trees. Yikes!!! But you guys....that's a HUGE job! 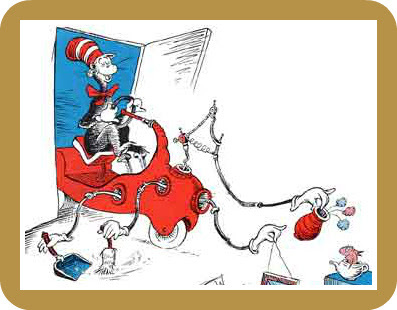 I like your reference to the Cat in the Hat's contraption. :-) That IS kinda what Dan's machine looks like! Oh I love all the beautiful leaves everywhere! We have alot of cedar and everbearing trees so don't get the beautiful blanket of crunchy to enjoy- just love the sound of leaves under my shoes! We could have used that contraption of your husband's last week. My husband spent about 4 hours blowing leaves onto the grass, then going over them (shredding) with the lawn tractor. He was dumping every 2 minutes. He's making me a couple of huge piles of leaves in order to make compost for the garden. Hopefully next year I won't have to buy so many bags of dirt. We still have leaves on the trees for another week or so. Your grass is so green and looks great!